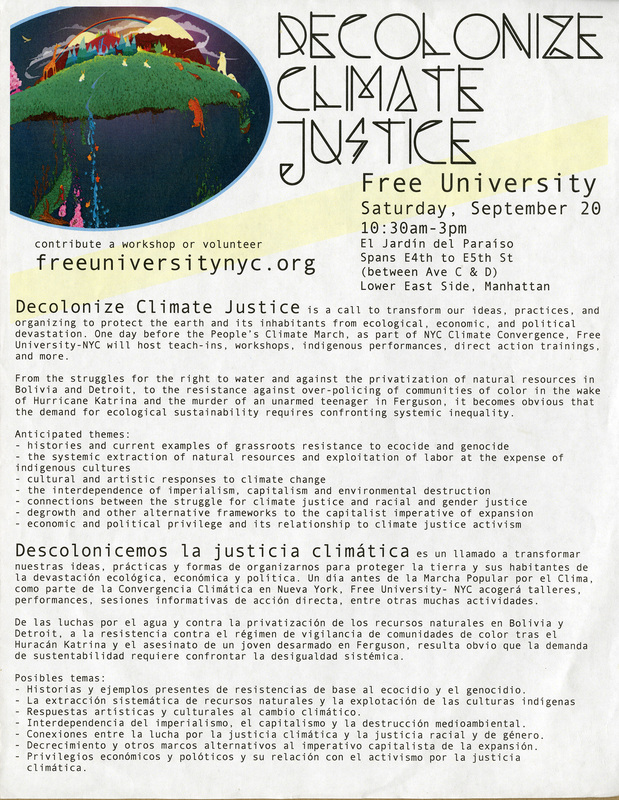 The Decolonize Climate Justice bilingual flyer is a call for workshops and volunteers. Held one day before the historic climate march in NYC, the Free University offered workshops, teach-ins, direct action trainings and indigenous performances positioned at the nexus of environmental justice and systemic inequality. The Free University of New York City is an experiment in radical education building on the historic tradition of movement freedom schools. The project was born out of the conviction that the current system of higher education is as unequal as it is unsustainable, while vast sources of knowledge across communities are all-too-hidden and undervalued. First conceived as a form of educational strike in the run up to May Day 2012, the Free University has since organized numerous days of free crowd-sourced education in community centers, museums, parks, public spaces, and subway stations in New York City. Rights | Copyright Free University of New York This work is licensed under a Creative Commons Attribution 4.0 International License. Cite This document | Free University of New York, “Decolonize Climate Justice,” CUNY Digital History Archive, accessed April 25, 2019, http://cdha.cuny.edu/items/show/6452.